It had four player controls, and it spoke. That was already enough to ensure the fame of any arcade game in 1985 - but it just so happened that Gauntlet was also awesome fun. Hugely popular in arcades the world over, this game is still extremely popular with many players. The original game cabinets are now extremely rare (and also very expensive) - but luckily at Liberty Games we have an answer! Several of our great value multi-game arcade machines feature Gauntlet as one of the many games, so you can still play the full arcade experience on modern fault-proof hardware. All those young whipper-snappers playing World of Warcraft, League of Legends, Diablo and games of a similar constitution must give heed and pay their respect to the title that helped lay the foundation for these AAA online experiences: Gauntlet. The first multiplayer game, Gauntlet was a visionary title that directly led to the cooperative gaming explosion that has taken the world by storm. As the game space continues to trend in this direction, it will be Gauntlet that is remembered as a founding father of this movement. Released in 1985, the Atari-developed title created by Ed Logg, allowed up to four players at once take on the increasingly difficult top-down, third person dungeon mazes, where the main objective was to collect items, hunt monsters and get the hell out of there by finding the nearest exit. But it was not just the inclusion of multiplayer that made Gauntlet an icon, it was also the audio. The game has the distinction of also being the first to make use of a narrator through the use of the Texas Instruments TMS5220C speech chip (an improved version of the chips-set that gave us the great Speak & Spell). Simple spoken text like "Warrior needs food - badly" "I’ve not seen such bravery!" and "Valkyrie...is about to die!" impressed. The game may have never been release had it not been for Logg's son, who was a huge Dungeons & Dragons player. Hounding his programmer dad to make a D&D game was enough the convince Logg that a foray into the fantasy genre may work in the arcade. 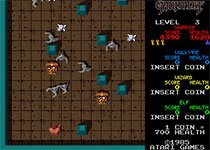 In fact, the original name of Gauntlet was Dungeons, but was changed to the former, when the latter became unavailable due to copyright issues. No matter what the title or inspiration, we are lucky that the game even made it to market. In the midst of a big shake-up at Atari, with layoffs common and financial issues at every corner, Logg had to deal with some major roadblocks in the road to production. All in all, development started in 1983, but was derailed multiple time due to firing, forced switching of projects and design changes, ultimately leading to the game being released in 1985. Walking up to the unit, you must decide whether to take on the role of Thor the Warrior, Merlin the Wizard, Thyra the Valkyrie or Questor the Elf, with each containing special skills, attributes and weaknesses. While Thor is certainly the strongest, he is also the slowest. On the other side of the token, Questor brings the speed, but not the iron. Merlin makes up for his lack of defense by being deadly with potions, and Thyra is a good overall character with relatively flat and equal attributes. 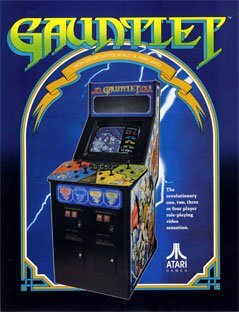 Being a phenomenon, Gauntlet had its fair share of intense and committed fans who figured out everything about the title. Savvy users could manipulate the game in order to play an indefinite amount of time, creating a monetary quandary for arcade owners who were losing money on this strategy, which in fact, lead to a ROM update being released which nerfed shot power and shot speed bonus’ for the Warrior and Wizard, and added a point-based difficulty counter, along with increasingly speedy monster respawn and less food. While the “less good” players among us might take issue with a hard game made harder, it is a true testament to the lasting impression and fanatical commitment gamers had for this unprecedented achievement in interactive entertainment.